In Week One, I was in love with my NaNo Novel. I woke up early each and every morning to fire up my laptop, eager to write and to add up each pretty little word and record them on my spreadsheet. I fell in love with my characters and with the art of writing and became completely immersed in the story. My NaNo Novel and I were in the honeymoon phase. My writing sessions produced pathetic word counts. Suddenly my writing, my plot and my characters which were shiny and new just days ago seemed dull. My ideas had never seemed more unoriginal. My “novel” was nothing but a collection of short scenes with talking heads. I fell out of love with my NaNo Novel. “Dang,” I kept thinking, this NaNoWriMo thing is HARD. Adding insult to injury, smack in the middle of Week Two, I got a cold. Not just a case of the sniffles, but the kind of cold that makes you feel like you could sleep for days. Great, I thought. Just what I needed. Perfect timing! I chugged orange juice, took a nap and kept sitting at the keyboard. I had several days that I didn’t write the 1,667 word minimum. For the first time this November, I fell behind. I thought about quitting, but I didn’t. Each writing session, I kept putting down one word after another. And slowly, they added up. Today, I am feeling as though I may have broken through the slump of the infamous Week Two. I’ve written 2,028 words so far today and feel like I could write more (and maybe I will!) I’m feeling excited about my novel again. That’s how novels get written. After a string of lousy days, I’m now past the halfway point. I’ve now officially made it past the point where I gave up last November. I’m going to celebrate those accomplishments. Then, I’m going to keep writing. I’ll be sharing my progress throughout November! Subscribe to my blog for NaNo updates and follow me on Twitter @iamJenniferK for helpful hints and inspiring quotes in 140 characters or less! 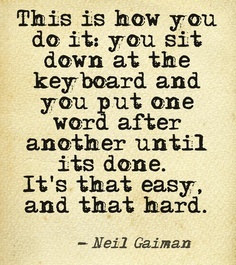 This entry was tagged NaNoWriMo, National Novel Writing Month, Neil Gaiman, Quotes on Writing, The Writing Process. Bookmark the permalink. Awesome! Glad you were able to catch back up. I had a little bit of the Week 2 slump myself, but luckily, I managed to pull out of it.